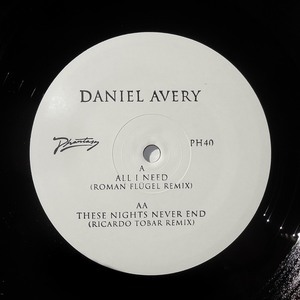 Phantasy Sound serve up another pair of remixes from Daniel Avery's world-beating Drone Logic LP, and this time they've turned to Roman Flugel and Ricardo Tobar to deliver the goods. Flugel takes on "All I Need" and rustles up a startling peak time burner full of earworm synth shimmers that show the German producer in his most club-ready mode, while keeping a healthy dose of the low-key moody tones of his own recent output humming away in the calmer moments. Ricardo Tobar meanwhile takes "These Nights Never End" into a leftfield headspace full of fractious rhythms, heavy layers of melody and noise, and an all-round rousing atmosphere.